With the coming of the Internet, gathering information on almost everything under the sun has become easier than ever before. Just type a few words and Google will throw up tons of information. For instance, there seems to be as many web pages on instructional designing strategies and Photoshop tutorials as there are eLearning designers. But there's a catch. You still have to click open the websites, scroll through them, and read up pages of text to fish out information that is relevant to your needs. It is easy to get lost in the minefield of information that the Internet is. What is scarier is that not all websites house authentic information. So how can you find what you are searching for quickly and easily? How do you make sure that you learn instructional designing theories and skills only from authentic sources? A Practical Guide to Designing for the Web: This masterpiece from Mark Boulton covers all aspects of graphic designing—typography, color, and layout—in one neat package. Visual Design Solutions: Principles and Creative Inspiration for Learning Professionals: This book written by experienced art educator and instructional designer Connie Malamed contains comprehensive guidelines and tons of practical examples to help you make smart-looking and effective design choices. Would you believe it that high-quality information can also come for free? Grab 50 lessons on graphic design theory here, or learn how to take your design from okay to wow with these 61 tips. There are tons of useful learning resources out there. But don't start on them without first flipping through the pages of Don't Make Me Think, Revisited: A Common Sense Approach to Web Usability by Steve Krug and The Design of Everyday Things by Donald Norman. Badass: Making Users Awesome: This book by Kathy Sierra teaches you skills and strategies to help you create "sustainably successful" designs. A comprehensive blog on the basic principles of creating seamless and intuitive UX designs. Design For How People Learn (Voices That Matter): This is an informative book full of practical tips to counter real-life instructional designing challenges, and the advice comes from Julie Dirksen, an instructional designer who has been there and done that and consequently, knows all about it. Learn to create great experiences by enrolling in this FREE course (especially pay attention to module #2). Learn User Experience (UX) Design online by taking this extensive FREE UX course. If you are a current (or aspiring) mobile developer, in this short (and free) course, you'll learn the best practices to plan and prototype apps before any code is written. Made to Stick: Why Some Ideas Survive and Others Die by brothers Chip and Dan Heath exposes the six essential traits that make ideas stand out, stick in our minds, and clinch deals. Get the skinny on effective learning strategies to make your courses ooze value from this free eBook. There's no better way to learn than from the experts. Learn what Christy Tucker has to say about writing powerfully effective voiceover scripts. It's a pity that you cannot jump straight into creating ID strategies or writing storyboards. You have to first learn the theories that govern instructional designing. Get a hang of the jargons and get an overview of the sundry theories with this classic: Michael Allen's Guide to E-Learning: Building Interactive, Fun, and Effective Learning Programs for Any Company. Then go over The Accidental Instructional Designer by Cammy Bean to get an understanding of what it takes to conceive of and create a powerful and memorable eLearning courses. This book tackles oft-neglected topics like how to interview SMEs and how to communicate effectively with your peers to enrich your skills. The ABCs of Instructional Design is a free course from Udemy that gives a bird's-eye view of instructional designing. Learn about the ADDIE Model in this video. Learn about Robert Gagne's multiple levels of learning from this video prepared by the Department of Instructional Design & Technology at the University of Illinois. Watch this video for six pointers on adult learning. Dash through these two 3-minutes videos, here and here, to pick up some ideas on the go. How can you convince prospective employers that you have the skills to create eLearning courses that bring out the wows? How can you convince them that you also walk the talk? Simple, create a portfolio to showcase your skills. Find your creative inspiration on Dribbble. Do the graphic design exercises in Creative Workshop. Take part in designing contests to hone your skills. You can showcase the certificates to prospective employers to convince them of your earnestness and willingness to improve your existing skills and learn new ones. Recreate a favorite design and give it your own quirky twist. Approach a non-profit organization and work voluntarily for them. They will be happy to use your help, and you will gain valuable work experience that will add substance to your portfolio. Being an instructional designer is a never-ending learning process. And the journey doesn't end after you have browsed through the above-mentioned websites or pored over the books listed earlier. 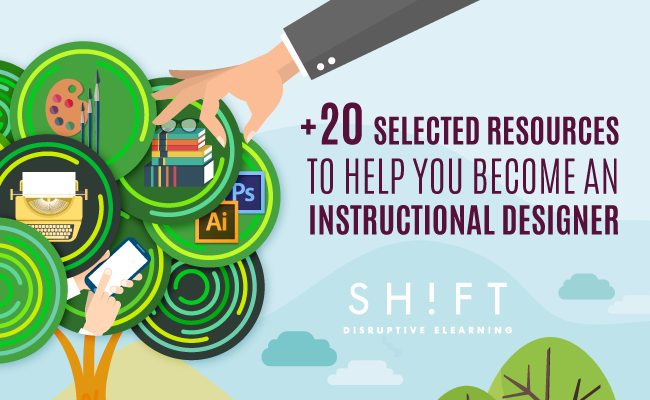 You have to keep updating your skills and knowledge to keep up with competition and to keep learners hooked to your courses with innovative offerings.